I am beginning to see more clearly what Andrew Revkin is aiming at here in his celebration of the "middle way". I think it's mistaken in emphasis. I consider myself a reasonable liberal, and what I see here in this pursuit of the middle is a reasonable liberal impulse, so I sympathize. Unfortunately, that impulse is taken to illogical extremes. It is not the case that things are either terrifying or benign or in between, and in fact one of the problems with climate change is that none of these positions is a reasonable summary. The idea of business as usual is terrifying, and after twenty years of perfectly clear warnings, some of which have already come to fruition, there is little sign that business has any intent of being conducted in any unusual way. Perfectly good solutions exist that are only modestly inconvenient and only modestly technically demanding. However, they impose immediate costs and deliver mostly long range benefits. Our decision making systems quite efficiently discount anything of the sort. Accordingly we march lemminglike toward the cliff, even though we don't actually need to. Anyway, that's my position, and I think it's Gore's position, and I think it's the position of most people who think about it a lot. Is it a middle position? If a man with a wild haircut, tattoos and a nosering dressed in an impeccably tailored three piece suit is modestly dressed, yes, I suppose so. Sometimes the truth itself is extreme. Nature does not subscribe to our political principles, and it is a futile sort of moderation that tries to get reality to compromise with culture, no matter how refined or well-intentioned that culture may be. We are not necessarily doomed; we have the technical capacity to solve our problems, but we need to develop substantially changed decision making mechanisms. There are places where there is no room for compromise or the friendly impulse to split the difference. For instance, net carbon emissions must not only stop growing but must shrink to near zero or negative values as quickly as possible. Stabilizing them at present values isn't a compromise worth considering, reasonable though it might sound. Update 11/16: I missed what James had said about this business in January. Go read it. Update 11/18: You have to give Revkin credit for livening up the conversation. Tim Lambert has some interesting thoughts, at Deltoid, have a look at my conversation with John Fleck at Inkstain, and don't miss Revkin vs David Roberts. As I always repeat, to the point of boredom, several years ago, scientists said the North Atlantic fisheries were being overfished and suggested cutbacks. The fishing industry had an opposing point of view. The government(s), Solomonlike, split the diference, allowing a bigger annual catch than the scientists recommended, but less than the fishing industry wanted. And it worked out so well, that the fishing industry collapsed. Update 11/21: See also my first attempt to come to grips with Revkin's misguided middlism. David Roberts has picked up the thread again on Grist today, referring prominently to your humble narrator. Steve Bloom's comment there is worthy of consideration. Oddly, he is saying the opposite of what I am saying, and yet I find it a much more useful model than Revkin's. That puzzles me. To put forward what may be way too irreducibly simple a paradigm for some, IMHO there are people who sincerely want to avoid dangerous climate change and then there's everyone else. There is no middle. It would be useful if you, as one of the scientists in the room, would be specific about what you see as "the cliff" we're all marching toward. One of the interesting strengths of Lomborg's book is that he gets quite specific in discussing the various hypothesized cliffs, and the costs and benefits of various approaches to not going off of them. 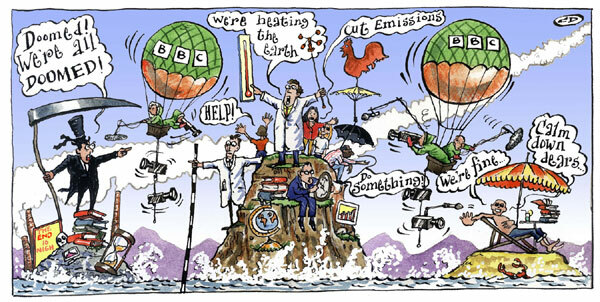 David Roberts, in his criticism of Revkin's pieces, describes climate change as a problem that "every responsible scientist acknowledges is potentially catastrophic". It's an assertion that's sufficiently vague ("potentially") to leave a lot of wiggle room, but it doesn't match the views of an awful lot of scientists I know. That's a great piece of writing for comments on a blog. I'm glad you decided to share it with your readers. I do think Revkin's middle path argument does have some merit, but the biggest problem with his recent blog articles about his arguments is that the authors he is pointing to Bjorn, Newt, Shellenburger, and Nordhaus is that they're almost as focused on promoting themselves than addressing the problem. There have been other authors who've released books outside the past 3 months who are worth reviewing and think tanks like RFF, WRI, and Brookings continue to attempt to hammer out papers that try to show us how to get where we need to be while attempting to minimize societal costs. If you do listen to bill mckibben (as an example) right now, who is becoming a momentous figure in the youth movement as seen at powershift, he intends to promote an agenda that extends beyond tackling climate change. It's not necessarily wrong, but it's not definitively the truth either. Furthermore, claiming that the scientific consensus is 80-90% by 2050 with a 100% auction (a climate change rally cry) isn't exactly the truth either. Especially, concerning the 100% auction, I think that is an proposed economic policy rather than peer-reviewed science. John, David's statement is almost entirely polemic; the weasel words "responsible" and "potentially" pretty much leave it saying in substance far less than it portends. That conceded, I also think there's such a thing as responsible polemics. There are various aspects of how economists think about costs and benefits that seem to me ill adapted for long term thinking. I appreciate the challenge and I'll think about it. Probably it's best not addressed in haste. Two things come to my mind immediately. 1) Why is a climate physicist (if you generously concede me that much) esepcially qualified to weigh impacts? 2) Why aren't the explanations already out there satisfactory? "The harder you bash something the more damage you will do to it." I had noticed and enjoyed your post at Dot Earth, particularly the final paragraph (3rd to last here). I'm glad you expanded it here. The "how to frame the issue to maximize the probablility of successful action" is a convoluted dilemma. I can sympathize with Revkin's concerns. But as you indicate, nature is totally value-free w.r.t. our politics and culture. If you try to craft the message so that you are, in effect, trying to mold physical realities to build public consensus, you run some enormous risks with that same public. Not to mention, operating somewhat delusionally. To begin with, almost every signal we are receiving back from the environment is confirming scenarios towards the "worst case" end of the spectrum - e.g. Arctic sea ice loss, global carbon emissions, loss of carbon sink capacity, etc. If you engage the public to act based on a "dumbed-down", soothing, "politics of possibility" version of this reality, you risk losing all credibility if you later have to keep going back to repair your message on an ongoing basis. Second, we know, based on latency and continued carbon-loading, that even when/if we get on with the task of reducing carbon emissions, we will be facing news like this c. 2025: "We have now successfully reduced global carbon emissions 27% since 2012. Meanwhile, 2024 has recently been confirmed as the hottest year on record, and the arctic ice cap set another summer low." In that kind of negative-feedback world (I am talking about human psychology), it will be very challenging to keep the momentum for change underway, unless you have been upfront about the challenges from the outset... E.g. that kind of latency/delayed benefit payback will have had to have been communicated beforehand. And this will be the reality even if you completely buy into the M&S "technology uber alles" mantra. If ever there was an issue when we need plain talk, this has to be it. Yes, in a political environment where large parts of the population believes in alien abductions, or that Fred and Wilma really did have a dinosaur for a pet, it is a lot to expect/hope for. But I believe that people are owed a clear articulation of the challenge, and will undertake the commensurate changes required once they understand the rationale. Spinning the message, or pointing to some kind of vague "Moore's Law for Energy Technology" as our salvation, even if near-term successful in kick-starting change, are more likely to eventually backfire and increase cynicism/resistance. In some ways, Revkin's key insight is "People don't like bad news. They prefer good news. Ergo, give them good news.". All true, but missing the point. coming from someone with your reputation, michael,this means a lot more. It's more than a little interesting to learn that I have a reputation. I do hope it's a good one. Does Pauchari Go Too Far?